Pet Insight Project is collecting billions of data points from tens of thousands of participants, but we know that each dog has a special story that can’t be told through sensors and medical records alone. We spoke with the human spokespeople (and loving owners) of a couple of very good Pet Insight dogs to learn more about their unique stories and how Pet Insight Project has influenced the way they care for each other. An experienced trucker from Nashville, David travels with his companion Rascal, a Miniature Pinscher, all across the country. It can be a challenge for a dog to adjust to life in a truck cab, but David has made sure that Rascal gets plenty of activity. 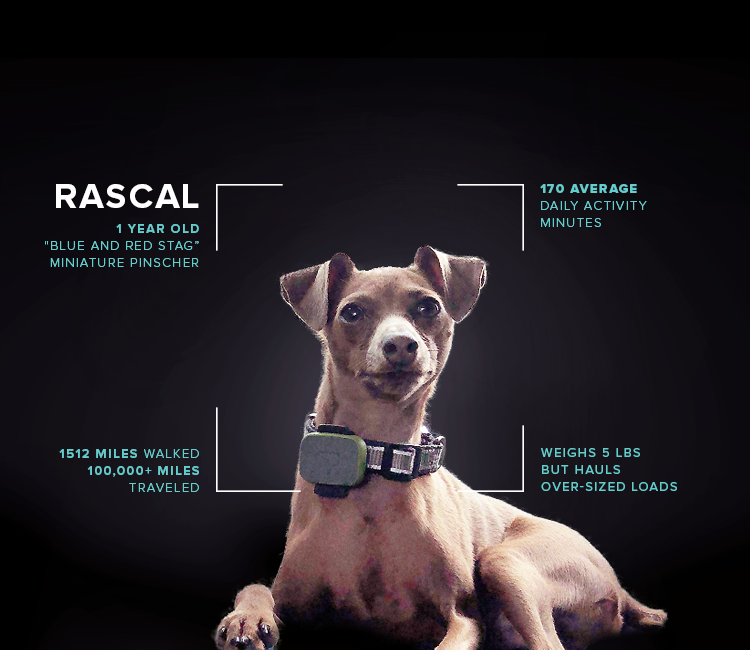 Rascal averages over 170 minutes per day, with David often traveling the literal extra mile to find the best place to take Rascal on a walk and satisfy Rascal’s strong preference for soft grass. This traveling “Min Pin” has caught the love and affection of customers all across the country, developing somewhat of a following. “I better have Rascal if I’m getting a load,” David quips. Rascal is David’s second min pin, making him a long-time Banfield Pet Hospital client. He appreciates the fact that Banfield locations are all over the country and all records are shared, allowing him to access everything he needs when he visits Banfield while traveling. While Dr. Hubbard in Nashville is a particular favorite of Rascal’s Banfield Veterinarians – David describes her as “a sweetheart” and “great at her job,” – accessibility is important for a the overall health of a tiny, 5 lb. dog on the move. Especially as he gets older, the Whistle FIT Activity Monitor has come in handy while trying to maximize Bubs’ activity and keep tabs on his picky eating habits each day. “I always try to hit the goal. If I don’t get the notification saying he met it, I feel like a bad person,” Juli explains. The flip side of this has proven just as helpful. After Bubs’ bladder surgery, Juli used the activity tracker to make sure Bubs adhered to his Banfield veterinarian’s instruction to limit activity. During periods of wavering health, Juli also makes sure to keep a watchful eye on the early-stage eating detection technology that Juli and Bubs are helping to test. Juli says the Pet Insight Project has made her a better parent to her dog. Since animals cannot verbally express their needs, she finds Whistle gives owners benchmarks for their pets’ lifestyle so they can adjust their care. Through Pet Insight research, we hope to deliver new information and insights to Juli and other pet owners to empower them to provide the best possible care to their beloved pets. Stella is a 13-year-old Bluetick Coonhound Mix. Jeanine adopted her 11 years ago and has always tried to keep Stella moving because she knows how important an active lifestyle is for her dog. “Research on humans says we need to stay active to keep brain and body healthy as we age - I think the same is true of our dogs,” she affirmed. Since joining Pet Insight Project, Jeanine has been monitoring Stella’s activity using Whistle FIT to track and support Stella’s healthful lifestyle. Stella is blind and has a thick medical file including cardiac problems, deteriorating kidney function, growths in the liver and spleen, and early-stage arthritis. While her health has slowed her down a bit, Stella’s Whistle FIT data tells a story of a much younger dog. She has met her 40-minute activity goals for 205 of the last 215 days, with a 124-day streak. Through their participation, Jeanine is hoping that Pet Insight research will result in technology that allows pet owners to better understand the quality of life of senior dogs, and provides peace of mind by illuminating clues about their well-being -- clues such as knowing Stella’s medication is working and she isn’t in pain. Stella is a tough girl who hasn’t shown signs of medical issues in the past, such as a hidden episode of pancreatitis after she gorged on cicadas in her backyard. Jeanine is optimistic that developing new Pet Insight capabilities -- such as monitoring eating behaviors of voracious scavengers and backyard grazers like Stella -- will help other dog owners make adjustments to avoid sickness and weight gain. Jeanine feels that as dogs age, their health requires closer attention. While the pair used to walk a mile all at once, Jeanine has adjusted to a few shorter walks, relying on the Whistle FIT to help ensure she is reaching the same goals by the end of each day. Pet Insight Project has provided her with objective data so she can rest assured that she is getting Stella appropriate exercise. 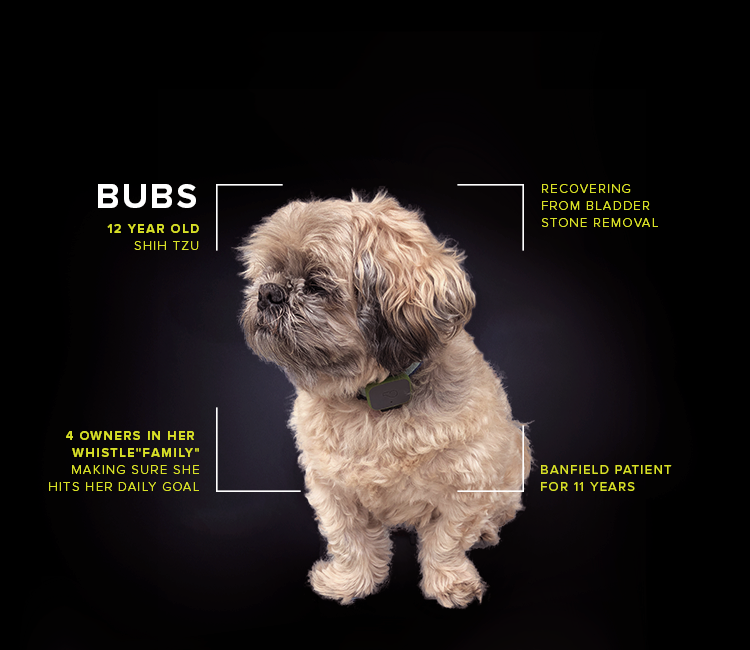 Providing the best care for your dog looks different at different stages of their lives.